It is said that everything is big in Texas, and that includes car shipping. Texas is one of many popular states that people choose to move to, and thus, ship their car. What is it about this Lone Star State that entices millions of individuals to stick around? For starters, we could take a look at Dallas, one of Texas’ largest cities. Dallas is one of the fastest growing cities in the nation. It is a haven of cultural amenities. In addition, the city offers an affordable housing market, thousands of jobs, and cuisine from top-rated chefs. The Mavericks, Cowboys, and Texas Rangers are just a few of the local sports teams. Don’t worry if you are not a sports fan. There are hundreds of other activities to occupy your time. Whether you are planning a vacation or move to Dallas, using car shipping services is the best way to go. Not only does it provide you with a hassle-free solution to get your car to your new home, but it is safe and fast, as well. If you decide to ship your car, you want to ensure its safety and its timely arrival. There are a few things that you can do prior to car shipping to get things started off on the right foot. Follow these tips to reduce the risk of damage and delays. It is important to document the condition of your car prior to the driver’s arrival. Prior to the inspection, you may want to wash the exterior of your vehicle. This will make it easier to see any existing cosmetic damages on the car’s surface. Note any scratches, paint chips, dents, or rust spots. One way to keep a record of this material is through photographs. Due to safety and weight reasons, auto transporters cannot transport any personal items. Therefore, you must remove all items, including GPS devices and CDs. You must also remove ski and bike racks. If you have an E-ZPass, you may want to remove that, as well, to prevent the accumulation of fees. In addition to the removal of personal belongings, there are other steps that must be taken. It is recommended that your gas tank be only one-quarter full. It is also important that you check your tires, as well as car fluids before auto transport. Learn more about How To Prepare A Car For Shipping. Dallas is one of the largest metropolitan areas in the south. For this reason and many others, people are attracted to the area to pursue a career, continue their education, and raise a family. Here a few things that you should know about Dallas. In Dallas, the average high is in the 70s, while the average low is in the 50s. The most pleasant of the seasons is fall and spring. While winter is mild compared to many other parts of the country, it can bring rain and an occasional snow. Summer temperatures can reach into the 90s, so dress accordingly. Be sure to wear sunscreen to stay protected from the sun’s harsh rays. Dallas is a good place for business professionals and recent graduates looking for work. The unemployment rate is below the national average. This is paired with a low cost of living and high wages, which make for a high quality of life. In addition, Dallas is home to many Fortune-500 companies, with the company’s headquarters being located in the city. Some of the top companies providing jobs in the area include Exxon Mobil, AT&T, Tenet Healthcare, Southwest Airlines, and more. You definitely won’t go hungry in a city with so many options at your fingertips. With a multitude of restaurants, you can get pretty much anything your heart desires, from old-fashioned southern cooking to Tex-Mex. You will definitely want to try shrimp and grits, BBQ, brisket, ribeye, street tacos, and lobster fajitas. Oftentimes, you will be getting around the city by car. However, the Dallas-Fort Worth Airport provides an alternative form of transportation if you are looking to travel long-distance. American Airlines and Southwest are both headquartered in Dallas. 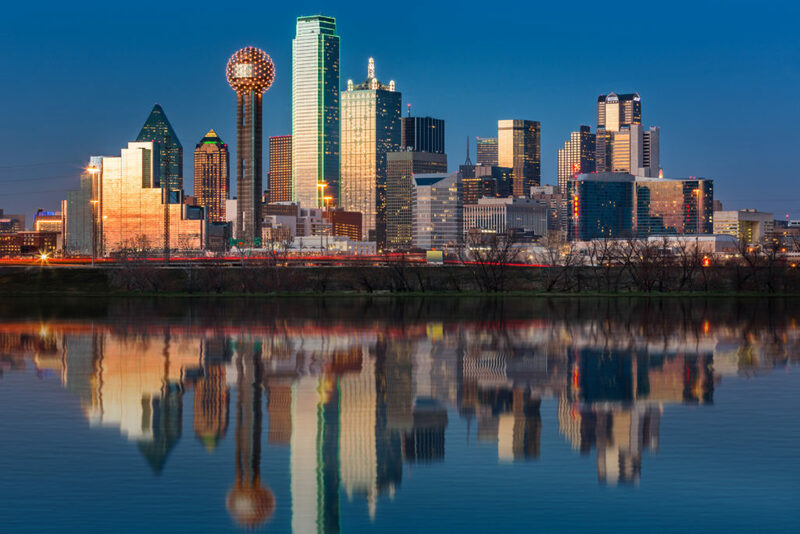 If you are looking to travel elsewhere in the nation, Dallas is in the perfect location, as many cities can be reached within just a few hours. You can travel from Dallas to San Diego, New York City, or Miami in 3 to 4 hours. With gardens, parks, museums, and aquariums, there are a variety of attractions to check out. Dallas offers something for everyone, from singles to families, with even budget-friendly options. Here are a few of the top attractions in the area. Dallas Arboretum & Botanical Gardens – This 66-acre garden on the shores of White Rock Lake features beautiful flowers, fountains, and more. Reunion Tower – This is the perfect attraction for first-time visitors, as long as you are not afraid of heights. This observation deck provides a 360-degree view of the surrounding Dallas landscape. Dallas Cattle Drive Sculptures – Let’s round up the cattle for a picture worthy of social media. Outside of the Convention Center, you will find 49 longhorn cattle statues being herded. Snap a picture before attending an event at the center. National Dispatch is a nationwide car transport service with a company-owned fleet. We make it our top priority to transport your vehicle in the safest manner possible. If you are looking for competitive car shipping prices, you have come to the right place. We offer a free, instant car shipping quote through our online quote calculator. It requires absolutely ZERO personal information, and it only takes a few seconds to complete. Just fill out four simple fields to get your car transport rate. If you would like to speak with one of our auto transport specialists, call us at 800-321-2051 or chat with us online.